We are very excited to unveil our April author event! 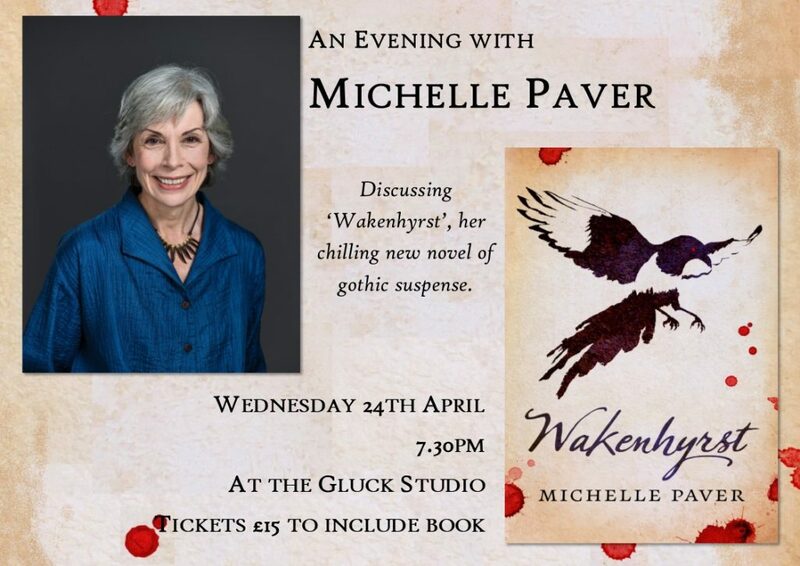 Celebrated novelist Michelle Paver will be at the Gluck Studio on Wednesday 24th April, discussing her latest novel, ‘Wakenhyrst‘, a spell-binding masterpiece of Gothic fiction which enthralls and chills in equal measure. The book is set deep in the Suffolk Fens, and follows the story of Maud, a lonely, motherless child who takes solace in the dank beauty of the Fen against the religious, repressive will of her historian father. When her father finds a medieval ‘Doom’ painting in a graveyard, unhallowed forces and a murderous obsession are awakened. Maud must hold strong in the face of the age-old legends of her beloved fen – and the even more nightmarish demons of her father’s past, as he becomes increasingly unravelled. Imbued with dark menace, the story maintains a tense ambiguity between the supernatural and the psychological. I cannot wait to hear Michelle tell us more about her research in the Suffolk Fens and the real-life ‘Doom’ which sparked the idea for the novel! Michelle Paver is also the author of ‘Dark Matter’, a terrifying ghost story set in the haunting wilderness of the far north in the 1930’s, and ‘Thin Air’, the chilling story of a mountaineering expedition in the Himalayas which ends in disaster, but is perhaps best known for the compelling ‘Wolf Brother’ series of historical fantasy novels for children, which have achieved ‘classic’ status on school bookshelves across the world. Tickets are £15 which includes a hot-off-the-press signed hardback copy of ‘Wakenhyrst’ and complimentary wine and canapes! Tickets are available via Ticketsource or by calling / coming into the shop. tel 01903 812062.